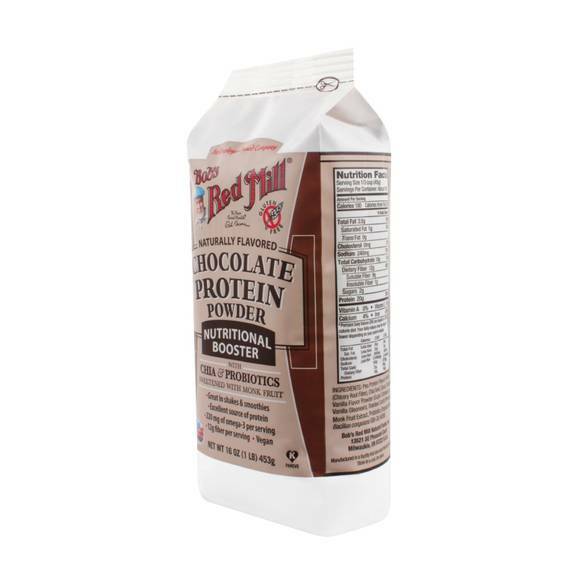 Bobâ€™s Red Mill, Protein Powder, Chocolate Is A Great Gluten-free Additive Product. This Product Contains No Added Flavors, Colors, Or Sweeteners And Dissolves Instantly, Making It Perfect For Shakes And Smoothies. Bobâ€™s Red Mill, Protein Powder, Chocolate Is Packed With 20 G. Plant-based Protein, 240 Mg. Omega-3, And Beneficial Probiotics In Every Serving. Every Bag Of Bobâ€™s Red Mill, Protein Powder, Chocolate Contains 16 Oz. Of Product. This Product Is Manufactured In A Factory That Also Processes Tree Nuts, Please See The Nutritional Facts Panel For Information About Possible Allergens.